This had originally been intended to play only in limited release in NYC and LA for long enough to qualify for Oscar consideration before going to streaming, but it's been so well-received that it's gone into a wide enough release that even small markets like mine are getting to see it in theaters! So I was delighted not to have to wait for streaming. I have never laughed harder at an Austen adaption. Truly captures Austen's wit for the screen. The plot is slight but the movie is appropriately short and the hilarious character portraits more than make up for any slightness of plot. The opening is a little rough (the character information seems overwhelming) but as it gets going you aren't lost. You will see it, and you will like it, or I will ship you off to Connecticut! This is the Whit Stillman Jane Austen adaptation I didn't know I needed! I went to this on a whim yesterday and was thoroughly charmed. 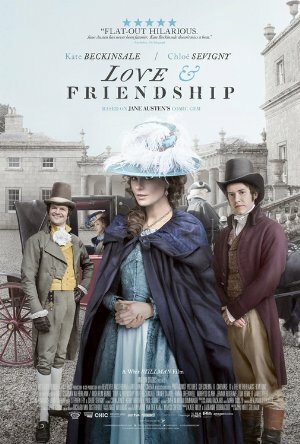 I really enjoyed it -- Kate Beckinsale is great, as is Tom Bennett, and both are clearly having grand old times. It's interesting how blind to interpersonal machinations all the men (except Stephen Fry and, to a lesser extent, Mr. Vernon) were -- to an almost but not quite unbelievable degree. That said I didn't quite the get point of Frederica's song at the end -- I think I missed the lyrics. Lady Susan is a wonderful antihero who dovetails perfectly with the movie's happy ending. Obviously the character isn't traditionally "sympathetic" but my own baggage makes me see a stark difference between extreme selfishness and active malevolence. So yeah, I was rooting for her. YMMV. And good Lord what a perfect fit having Whit Stillman whip a Jane Austen epistolary novel into a screenplay. This was a DELIGHT, so carefully observed! So much passive aggressive jockeying! So very Regency! So very "yes I only have this one dress" So much face saving! I like how Sir James is dumb but also aware there's something off with him and thus, kind of terribly anxious and nervous all the time but also so rich no one is ever going to tell him what, exactly is wrong with him. What a nice crisp 90 minutes this was, like dry champagne. Yes, it was interesting to note the difference in what I felt I wanted as an ending for Lady Susan as the show progressed. Just give Tom Bennett an Oscar, please. Tom Bennett! What a revelation. I wasn't as enamoured of the direction as others have been, it certainly wasn't subtle, and I felt that Chloe Sevigny was miscast. The ending was a bit abrupt. Still the costumes were gorgeous and Tom Bennett was definitely the highlight. My line on Kate Beckinsale is that although the action movies she appears in aren't great movies (though I enjoy them a lot in the way that some people favour Steven Seagal movies, and they're perfectly acceptable with take-away food and beer), I do respect the choice she made to run away to Hollywood and do that rather than stay in Britain and spend the rest of her life, as I always put it, "simpering in bonnets". So it looks like the laugh's on me, then. Saw this yesterday. Really enjoyed it, as I'd hoped to. Only gripe is the couple of major plot things that happen off screen. I just felt like the writing didn't quite leave enough clues to make the offscreen plot shifts as clear as they should have. Like the proposal - it seemed like maybe we were supposed to infer Reginald had proposed to Lady Susan, but it didn't feel clear at all until it finally came up in conversation. Just felt like either slightly weak writing, or maybe some scenes got edited out that shouldn't have. But that's a quibble. Very delightful overall, and a refreshing take on the whole Austen/Regency Romance genre. Got my DVD today! Excited to rewatch.